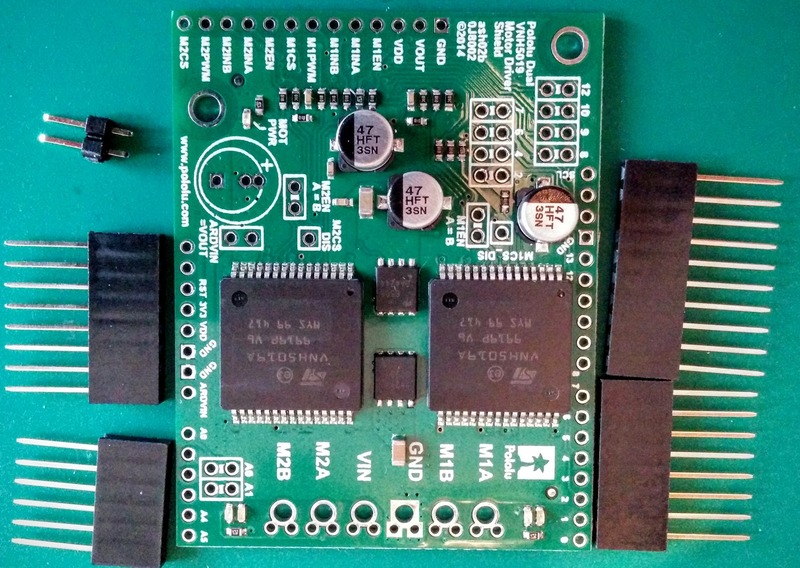 Optimus Pi: A whole new - Motor Driver? In my last blog posting I was having trouble with the original motor driver I'd selected and had decided to order a different one. The new model is the Pololu dual VNH5019 motor driver and I spent this weekend soldering and connecting it up (At least when I wasn't busy playing with BB-8). 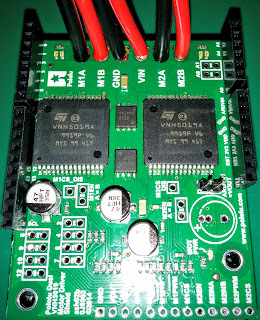 This board has a couple of advantages over the previous one, it uses a newer motor driver chip, can handle a wider range of input voltages, has separate break out pins for running the board without an Arduino, passes through the extra SDA/SCL pins on the Arduino, allows the Arduino to be powered from the battery and comes with a software library to make it really easy to use. Best of all when I loaded up the example code both sets of motors can be seen to move forwards and backwards! 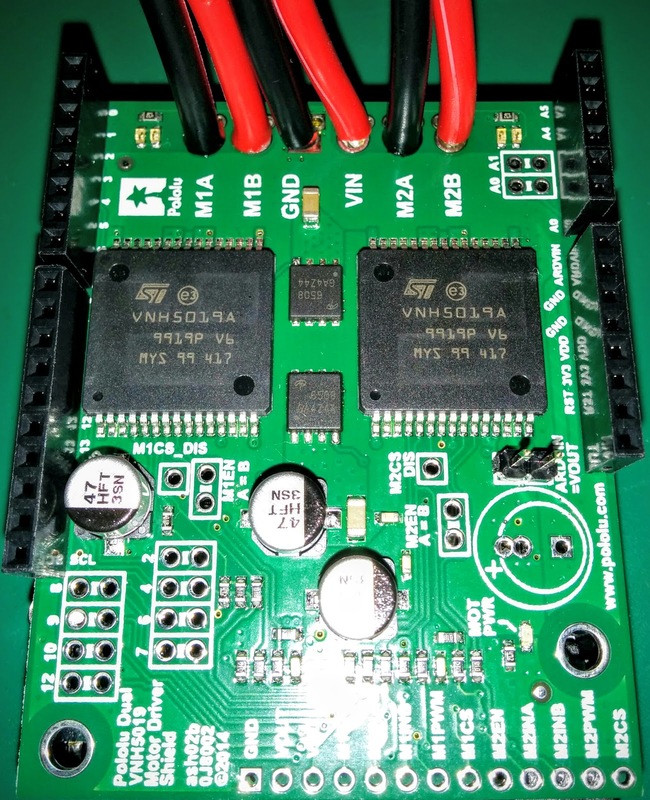 As, hopefully, this will be the last motor driver board I solder up for this robot I thought I'd detail how I went about putting it together, in case anyone else finds it useful reading. 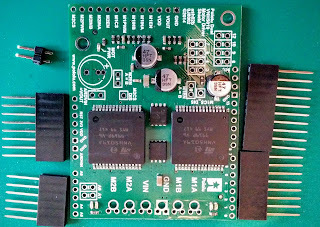 First I took all the components I was planning on soldering to the board and checked that they fitted correctly (This particular board comes with multiple ways of being assembled). Next I started adding the Arduino shield connectors. First I insert the connector and add solder to one pin, holding it in place. 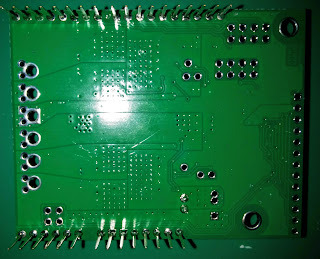 I then check the position of the connector and, if I'm not happy with it, heat up the solder and adjust the fitting. Its important to get everything lined up correctly, otherwise the shield won't plug into the Arduino. 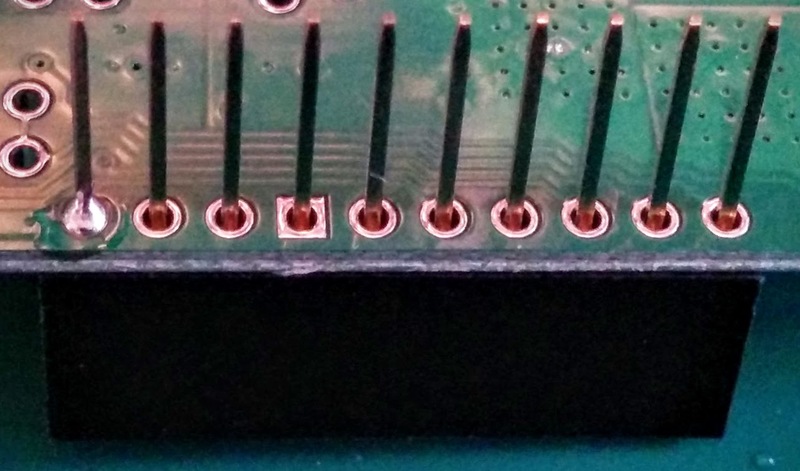 Once I was happy I then proceeded to apply solder to the rest of the pins. With one connector fixed into place I worked my way around the rest of the board, periodically cleaning and re-tinning my soldering iron to ensure there weren't any build ups of solder, and to try and ensure the new solder melted quickly, as the longer the soldering iron touches the pins, the more heat is transferred into the board, potentially damaging it. All the shield connectors and jumper connected. Next was attaching the battery and motor leads. I had already cut these off from the old motor driver and tinned the ends. 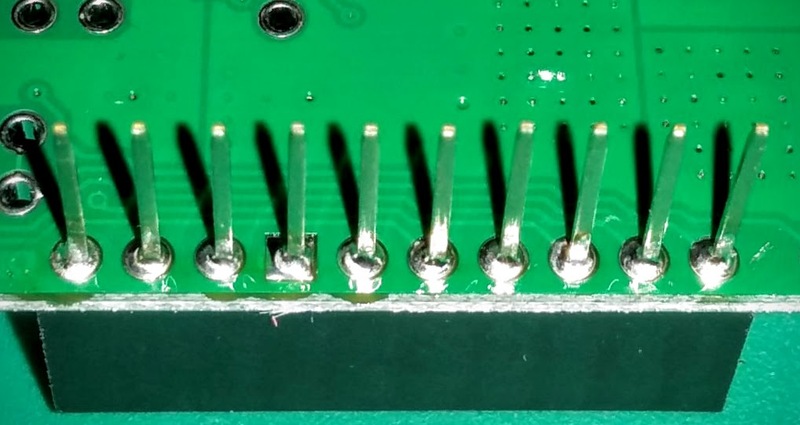 I was expecting these to go fairly smoothly, but for some reason the solder just didn't want to co-operate, refusing to stick to the board or the wires.. just blobbing up on the end of the soldering iron. Even using a flux pen didn't seem to help much.After a little perseverance I got the wires connected, but without the nice smooth looking solder connection I had managed on the previous board. Looks a little messy, but does the job. The way this shield sits on top of the Arduino means that the motor/battery connections are dangerously close to the ICSP pins. So, to reduce the chance of contact if the robot went over any bumps, I used a glue gun to cover the exposed connectors. Then it was a case of plugging it into the Arduino and checking that everything was working correctly. 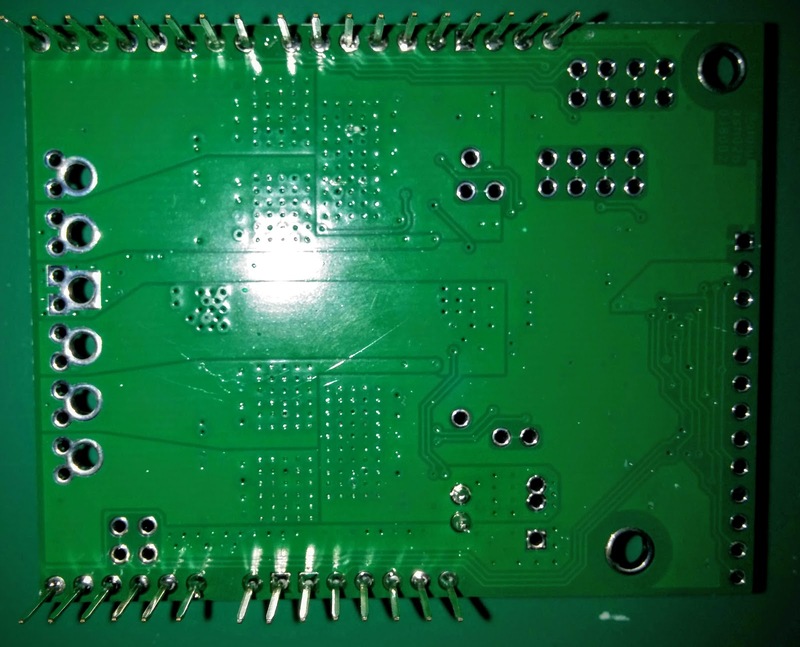 I did run into a problem with one of the jumper pins not being connected correctly, but a quick re-heat with the soldering iron got it sorted. Next job is to install this motor driver onto my robot, but not in the hap-hazarded way I did last time to test it worked, but in a more permanent way.